There's not usually a lot of activity at Palm Beach's exclusive marina around 5:30 in the morning. But when we showed up there a few weeks ago, a small fleet of boats was preparing to venture into open waters for the 50-mile journey to the Bahamas. For these well-off boat enthusiasts it was the beginning of a weekend mixing fun in the sun with a good cause. We were there to cover an important environmental story for the Evening News. We were heading over to Turtle Cay, a small Bahamian key where a small fish with a big appetite had taken over the reefs. It's called a lionfish and – having arrived in the U.S. as a pet – it is poisonous and so has no natural enemies here, which both government researchers and local fishermen describe as a grave danger to the fragile ecosystems of this part of the Atlantic coast. The group we were with – headed by an unstoppable Palm Beach organizer, Bobbie Lindsay -- was going to try and help the local fishing fleet catch some lionfish and serve them for dinner. The idea behind the event – which organizers called a "lionfish rodeo"--is that the only predator that could possibly take on the lionfish, that are protected by an array of spines that can deliver a very painful sting, is us. To make things a little more interesting, Bobbie and her friends promised a $2000 reward for the team that caught the most fish. First, we had to get across to the islands and, as the small flotilla of yachts and boats made its way out to open waters, the sky darkened. We were headed straight into a storm, aboard small pleasure-crafts without a working radar system - not a good idea. Several boats turned back and headed for the safety of the Marina, but our gracious hosts, Tim and Blair Givens, stayed out in the open waters, waiting for the first chance to head back out. At 10 AM Tim decided the storm had passed and gunned the boat's engines. We were off, along with 3 other boats. We were planning to film the passage but, as we raced across the waves the storms left behind, it quickly became obvious that we needed to hold on tight if we wanted to stay aboard and the camera went back into the hull. Four hours later the boats arrived in the clear blue waters of Spanish Cay, where we docked briefly to clear immigration, which – in true Bahamian fashion – meant that we all crowded into a bar where an immigration officer had occupied a corner and proceeded top stamp everyone's passports while they waited for their drinks to be served. Then it was on to Turtle Cay, where a crowd of local fishermen were anxiously awaiting the arrival of the Palm Beach teams. Bobbie greeted all the derby participants and introduced two leading lionfish experts who were there to demonstrate how to safely catch, clean and cook a lionfish. Stephanie Green is a Canadian researcher who has been studying the lionfish population for years. Lad Akins is a dive master turned conservationist. His organization, Reef Environmental Education Foundation (REEF) has been organizing similar events in the US and the Bahamas. Lad and Stephanie explained the science behind the growth of the lionfish population and the reasons why it was crucial for man to step in and control that growth. They then explained that it was safer and more human to catch lionfish with a net than with a spear gun. The Bahamian fishing teams, who had been scoping out the best spots to catch lionfish for weeks, giggled. They had their eye on the prize and no intention of using nets. The next morning the American guests slept in, recovering from their long journey and concerned about the weather, which had turned violent again. That didn't stop the local fishing fleet from disappearing before daybreak. The fishermen mostly used spear guns, free-diving on reefs and sunken boats, places they knew that lionfish, which are voracious predators, like to hunt. As the boats started to make their way back to the harbor, dumping coolers full of freshly caught fish onto the dock, it was clear that the event had been a success. With Lad and Stephanie acting as referees, the fish were counted, weighed and measured, before being cleaned and filleted right there on the dock. A large crowd had gathered, fascinated by the strange-looking catch and anxious to find out who won the big prize. By 6 PM all the teams had returned and all the fish had been counted. The teams from Palm Beach (including Bobbie's team, of which we were honorary members) had barely even made it onto the scoreboard, which didn't seem to bother anyone. Thomas Sawyer, a local lobster hunter, took first prize, having personally speared 289 fish. It was time to eat. The fish were prepared two ways – the Bahamian way (deep fried in a spicy batter) and the American way (butter, garlic and lemon) and served to the hungry crowd. The fishermen were doubly happy with the day's catch. They had caught more than 1400 fish in one day and were hoping that the impact would be felt for months, allowing the native fish population to rebound. According to James Morris, who works with a small team of NOAA scientists to track and study the growth and control of the lionfish population, days out like this may not be the perfect solution to the problem, but are pretty much the only solution currently available. 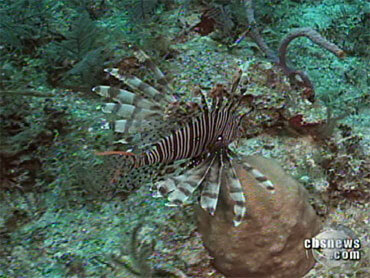 "We cannot offer a natural predator for lionfish," he says, "which is a real concern. It also increases the importance that we become a predator of lionfish and that we provide that mortality to keep their population in check." Morris says that the only long-term solution to the lionfish problem may be the creation of a formal fishery, making it possible that one day this colorful predator may be coming to a supermarket near you. Tune into the story tonight on The CBS Evening News with Katie Couric.